At their simplest, prayer beads are beads strung together in a circle used as an aid in reciting prayers. They are crafted in different designs, depending on the tradition they come from, but, most are formed in a circle. 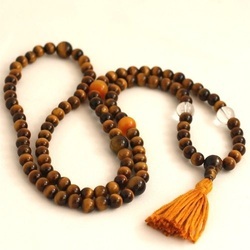 Since the symbolism of the circle, of a never-ending path of rebirth and interconnection, is so powerful, it's no wonder that prayer beads often take this form. They can also be in the shape of a single strand, or in the traditional form of a Catholic rosary, a circle with a short length of beads and a symbolic pendant attached. Mala's, used by Buddhists, are also strung in a circle and traditionally have a tassel attached. The Orthodox chotki, or prayer rope, is make of cord or yarn, knotted 100 times and fastened in a circle. Some form of counting prayers has existed since the first spiritual seeker pocketed a pebble as a reminder to pray. History will only know who first drilled a hole in a seed, or carved a wooden bead to string on a cord for a spiritual purpose. Recorded history tells us that prayer beads originated in the East and were first used by Hindus. Sculptures from India, circa 185 BC, show figures holding prayer beads. This spiritual tool then spread to Buddhism, Islam, and finally Christianity, specifically, Catholicism. 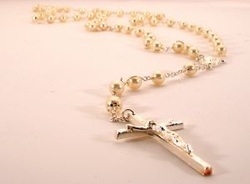 The rosary, called a paternoster in it's earliest incarnations, was first used around 1000 AD. 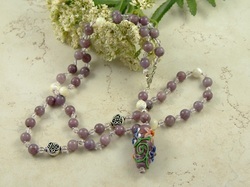 Buddhist Mala ~~ Picture and lovely craftsmanship from Heart of Compassion Malas. In our time, different faiths and individuals seeking an aid to their spiritual paths are rediscovering some form of prayer beads. Prayer beads are also evolving as aids to wellness, recovery and stress relief. Contemporary prayer beads take on different designs and are composed of beads of varying textures, colors and sizes. They may be dedicated to a specific deity, carry a symbol that brings inspiration, draw on the healing properties of crystals, or are created to mark a special life event. 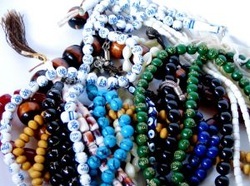 What draws an individual to a particular set of prayer beads is unique and personal; just as unique and personal as the forms contemporary prayer beads take today. Any sort of beads, from the humble to the precious, can be found strung for prayer beads - glass, plastic, crystal, gemstone, pearls, bone, wood, ceramic, seeds, shells, metal, and probably other materials I can't think of. Most designs include a circle. Traditional Catholic rosaries are "wire and chain" rosaries, with individual beads strung on wire looped on each end and fastened together. Groups of beads are then connected by a short piece of chain to the central connector and the crucifix. With the widespread availability of jewelery making supplies, hand crafted rosaries are also strung on jewelery wire. Prayer beads are also made with the wire and chain technique as well as looped chain, wire wrapping, jewelry wire, cord, or ribbon. Designs may be a simple loop, rosary style, a single strand, and even prayer bead necklaces and shawls. Prayer beads are perfect for any sort of chant or prayer pattern. If count is important, like with Catholic rosaries or Tibetan Malas, the number of beads keeps you on track. When used for more free-form or spontaneous prayer, the tactile feel and the motion of passing each bead through the fingers lends a focus and energy to prayer or meditation. Crafting personal prayer beads, and choosing the symbolism, colors and design makes a meaningful addition to an individual's spiritual life. These prayer beads can adorn a personal altar or sacred niche. Prayer beads can also be used to enhance personal wellness as a tool for stress relief, recovery, affirmations, and positive imagery. The more an individual uses prayer beads, just having the beads settle in the hand helps draw the mind and spirit to quiet, spirituality and contemplation.